The Grassmere historic gardeners placed a bird bath atop this stump. 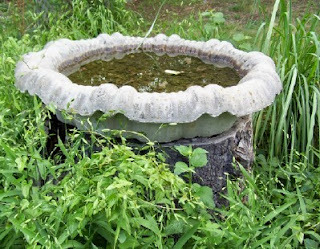 It works because the basin is as wide as the stump itself. You might also find a shallow copper bowl or galvanized metal trough. Native plants disguise the base for a natural look. 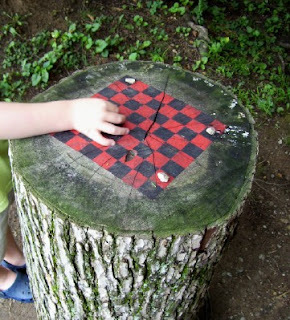 My favorite: the Ellington Agricultural Center's painted checkerboard stump. The gardeners added log stools (cut from the upper portion of the tree) for casual seats around the stump. My DH rented a stump grinder for the weekend ... it wasn't cheap -- about $100. But he, and our next-door neighbor worked on our yard and the next door yard. I think we estimated they ground out about 30 stumps that weekend ... some from 25' pine trees and some from slender, spindly trees. We went with a birdbath and three potted plants. The checkerboard is a cool idea. I'm going to make one of these for the interpretive center at the State Forest I'm working at this summer. Cute ideas. I can't resist rescuing a good stump when I see one. I live in New Jersey and unfortunately there were quite a few piled up after Hurricane Sandy. I think of it as recycling.Thanks for sharing!